The first image that comes to mind for “mohawk haircut for men” is long spikes along the top center. While this is indeed one type of mohawk haircut, it’s not the only type. You can get a shorter version which can look a little more moderate than the long spikes. Our showcase of this type of cut for men includes all mohawk haircut lengths so you get an idea of the many different types via these examples. Dark, natural hair in a mohawk style with minimal faded sides. This hairstyle is somehow a mash-up of tribal and modern looks. Freestyle I Did Today! Stepping Out Of My Comfort Zone! I Normally Don't Do These Type Of Designs..
Long hair in a mohawk style enhanced with some creativity. The etched designs are made accurately to be able to portray some edgy and unique details. Typical dreadlocks styled into a mohawk cut. The overall finish is cool and edgy, not to mention unique. The latest upgrade for Mohawks would be, incorporating some color hue. Plus, adding a shaved style gives it a fun boost. This short and curly look is definitely an eye-catcher. It has Caesar cut inspired upfront, a Mohawk cut in the back and classic fades on the sides to complete the look. A fun artwork on the sides of the is unusual but this cut has its own eye-catching style. This cut keeps the middle long formed in a mini frohawk while the sides are faded in order to show off the magnificent artwork design. This black Mohawk has long length with a bleached part on the front that acts as the main focal point of the look. Top up this with cleanly shaved sides and your hairstyle is all set. This cut creates a more smoother look with its locks tamed and sides faded. The pointed tip of the beard gives this style its own individual touch. Adding colors to your cut is always fun and creative especially with Mohawks. It's unique, innovative and makes your style more distinct. These natural locks are bleached to create a lighter shade at the ends and left fairly long, being tapered towards the nape. The side part is shaved into a graffiti-like set of lines. The sideburns are removed completely, and the neckline is cleaned up to blend with the design. This look with short shaped spikes is a wider style covering most of the top of the head. 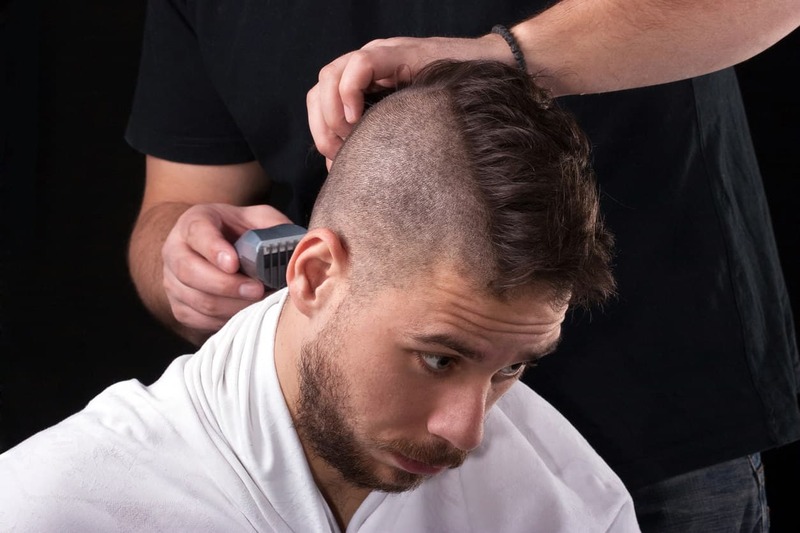 The short faded sides help to lift up the style to the Mohawk level, and the square hairline with an acute angle is supported by the same angle of the cheek line. These natural curls just want to be free! But while they are released to reveal their texture, the edges are tamed. The forehead hair line creates a square looking profile, and the faded temples melt into the smooth skin with not a hint of sideburns. The forehead hair line creates a square looking profile, and the faded temples melt into the smooth skin with not a hint of sideburns. These natural curls and perfectly cut edges complete the whole Mohawk look. This faded Mohawk is a classic smooth look that will remain timeless. The lines at the jaw are slightly curved, and the line at the base of the neck is horizontal, very neat and visually appealing. This style here has a more distinctive razor detail. Those sharp wings with a sweeping curve behind the ear give the effect of a runner in motion, and also appear artistic at the same time! This curly hawk has one thing that sets it apart from the others -- it has a super accurate edge with facial hairstyle plus sideburns. The contrasting straight lines up top give the look an added edge. This one-of-a-kind style creates an aerodynamic look that is not soon to be forgotten. The hawk is combed over to one side, and the design shaved into the sides follows the lines of the top ridge. Behind the ear, an angled detail creates the ornamental nape line.